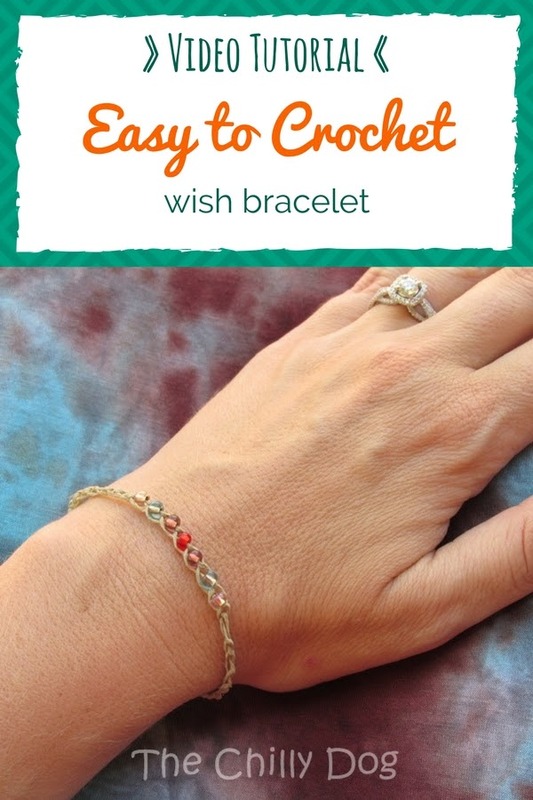 I had never heard of wish bracelets until I discovered a tutorial how to make a braided wish bracelet by Happy Hour Projects. You make the bracelets from hemp and small glass beads. The idea is that when you tie the bracelet onto your wrist you make a wish. Over time, the hemp naturally weakens. When it wears through and the beads fall off, your wish is released and will come true. These are pretty little bracelets for summer and the braided version would be a perfect craft for kids and teens. However, my grown-up fingers got a little numb after braiding a number of these bracelets for my daughter, niece and myself. So, I modified the design a bit and came up with a crocheted version. If you can chain, you can easily complete this project in less than 10 minutes. Basically, you slide the 7 beads onto the hemp. Then, with your crochet hook, chain until the piece measures 5-6 inches. Slide one bead up to your crochet hook and chain 1 to lock the bead into place. Continue to slide the beads up to the crochet hook, one at a time, and lock each into place with a chain 1. Then chain for another 5-6 inches and fasten off. Here's the video so you can see exactly how to secure the beads onto the bracelet. May all your wishes all come true!